What better way to get your message to your prospective customers than to place it right in front of them as they walk around and do their daily business? Most marketers don’t take full advantage of the many options for outdoor advertising. The most obvious one — the full-sized billboard beside a busy road — is great if you want to target drivers with a daily message and you have enough sales to justify the cost of giant signs. But you can also consider other types of messages, including flags, awnings, and mobile signs on vehicles. The next sections take a closer look at these options and more. A magnetic sign: This sign is the cheapest and most flexible because it can be moved from vehicle to vehicle, but it doesn’t make as strong an impression as a painted sign on the side of your vehicle. A painted sign: Airbrush artists are available through body shops and local web searches to decorate your car with durable painted lettering and images. Review a portfolio (photos of earlier jobs) first to make sure you like the artist’s work. The cost ranges from a few hundred dollars for simple designs to more than a thousand dollars for elaborate images. 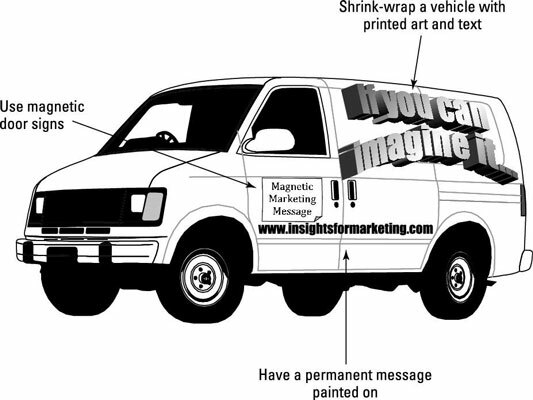 A shrink-wrapped sign: Even more impressive, but also more expensive, is a shrink-wrapped sign that decorates most of your vehicle with your brand identity and marketing message. You can blow up a photo, a logo, or any other artwork as big as your vehicle can handle. The art is printed on special plastic sheets that are then shrink-wrapped right to the vehicle for high-quality art that makes a big impact. Although the setup costs are in the low thousands, you can apply the same design to multiple vehicles (such as a fleet of vans), and the cost per added vehicle is far less. The figure shows examples of these three options.